Few true events lend themselves more perfectly to film than the 2010 Chilean mine collapse. There is more drama, peril, resilience, and joy in the facts of this incident than anything that could believably be created in a piece of fiction. Director Patricia Riggen tackles the story of the miners trapped about half a mile below ground. With food enough for three days, all 33 men survived an impossible 69 days. The story that mesmerized the world is not just of the unbelievable perseverance of the miners themselves, but also of the tenacity of an international team of engineers who worked against both overwhelming odds and an urgent timeclock to save them. There is no end to the cinematic possibilities available in this deeply moving, thrilling story, which is why it’s so unfortunate that Riggen layers on so much artificial melodrama. Antonio Banderas and Lou Diamond Phillips anchor a cast saddled with one-dimensional characters, each allowed a particular flaw to overcome or an inspiring trait to benefit the group. 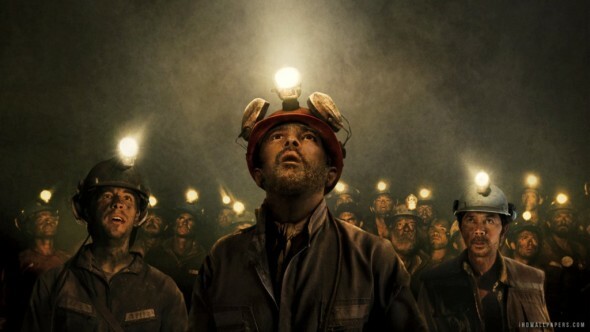 Riggen undermines the miners’ struggles by inexplicably skirting a claustrophobic feel, allowing no one the chance to truly panic or lose hope without Saint Mario (Banderas as inspirational leader Mario Sepulveda) swooping in with a word of wisdom to put everyone back on the right track. Events above ground are treated with even less integrity, as engineers undergo lengthy, obvious epiphanies, and families offer little more than tearfully unwavering support. Riggen’s script, adapted by a team of writers from Hector Tobar’s book “Deep Down Dark,” leeches the human drama and complexity from all the events surrounding the collapse, replacing it with by-the-numbers disaster flick clichés and easy answers. Most of the actors struggle with accents (I’m looking at you, Gabriel Byrne), and the back and forth use of Spanish and English only further exacerbates the film’s lack of authenticity. And yet, when that first miner is lifted from his would-be tomb, it is impossible not to be moved. Because this really happened. Thirty three humans spent more than two months 2300 feet below ground, all the while understanding that their chance for survival was infinitesimal. Their ordeal is incomprehensible, and the fight against hopelessness and financial complacency to free them is genuinely inspiring. The miners received no compensation from the company that stranded them, and this is the best Hollywood can do? ← Blood! Guts! Heavy Metal!